I have been perplexed at times, while traveling in Europe, about a task I consider here at home to be pretty straightforward - flushing the toilet. I remember when I was a child, entering a public restroom in Europe was often a mystery. What sort of medieval plumbing contraption was I required to push, pull, turn, yank or crank to finish the job I came to do? If you haven't chanced upon a pull chain device such as this before, certainly you might search all around the commode looking for a button or lever to flush. If you are a young child, you undoubtedly wouldn't think to look up to do the job. And if and when you finally do, there's the likelihood - as in this photo, that you possibly cannot even reach it. Europeans have gone green, way more than we have here in the U.S., and although we are starting to see dual flush toilets here, the different varieties of mechanisms will cause you pause each and every time. 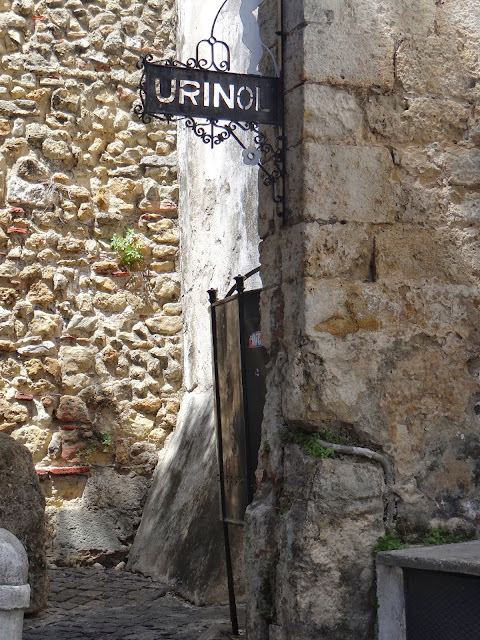 And, of course, you know I have to bring up everyone's favorite foreign commode: the squat toilet, also known as the Natural Position toilet (yeah, right, natural for men maybe). Are these still found in civilized countries? Yes! The photos below were taken by my friend recently in Italy. I've encountered them as well in Greece, Hungary, and even France. If you have a young daughter, do not let her attempt to use a squat toilet without your help. I never managed these latrines as a child without tinkling all over my pants and shoes. And let's just say the germs your child might come into contact with if you're not there to avert a slip or a fall would probably warrant a tetanus booster. Sometimes in a foreign restroom you will read a sign, occasionally in legible English, asking you not to place toilet paper in the trash receptacle. You may wonder why the need to elucidate such an obviously nonsensical idea. That is because there are some countries with poor or no plumbing where you WILL be asked to deposit your toilet paper in the trash receptacle because flushing it will clog the toilet. Men, like always in these matters, have little difficulty finding a place to go in Europe. Public urinals are an accessory to many historical buildings in Europe, such as this ancient looking urinol adjacent to the Castle of São Jorge in Lisbon (below) and another near the historic center of Gouda, in the Netherlands (also below). Urinal in Gouda, the Netherlands. And always remember to have a bit of spare change on you when entering a WC in Europe because you never know when you might be caught by surprise by a Klofrau wanting to wipe down the seat for you! So funny! Every traveler can relate! I still remember pink toilet paper in Czechoslovakia and those ubiquitous squat toilets in China. Gross,Just fun, I'm not going to ask questions about my toilet at the end, but I do not think will be able to use it until now.